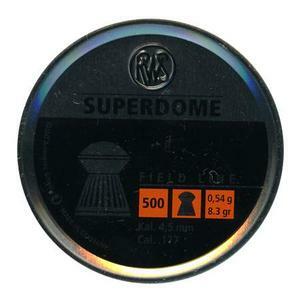 Superdome Domed Pellets. The so-called English bulldog design with a round head. The pellet has the typical quality features of RWS air gun pellets and is ribbed. Still my favorite good all round pellet . Use these pellets quite a lot good price but find not best after 50yds. Would recommend..
Used before and would highly rate this product fast and accurate. Best pellet so far for my hw100...accupell shooting all over the place. Good medium weight pellet .Both my Prosport and my Walther lgv like these a lot. I bought more of these pellets than any other brands they suit my weihrach 100 so why change. Never had any foul the magazine which has happened with other brands. Nice accurate pellet from my Gamo Coyote. Tried many different pellets but have now settled on using RWS super dome. Good allround pellet for many uses and reasonably priced. Works well in my HW rifles. Tried many types of pellets but very happy with Superdome in my weihrauch 110. I use these pellets in my Walther rifles and they give good tight groups. I brought a tin of these to try in my AA S400. They were more consistent than my usually pellet the AA field diabolo and half the price too. I won't be going back to the AA pellet. Give them a go you won't be disappointed!! Quality and affordability that is very hard to beat. Very shiny and clean well made pellet that groups on a par with the best in my HW101. just zeroed my wh100kt using these, pellet on pellet at 30 yards, that's good enough for me. pellets are nice to handle and look very well made. I don't see the point in paying any more when these are so good. I use these in .177 and .22 in both my Ultra's and find them incredibly accurate and consistent out to 55 yards and they group lovely. I use these in a BSA Comet and an Air Arms Prosport. They are well made and give consistent performance, at least in my rifles, but we all know that every barrel is different. Worth a try especially for the lower end springers.